There are multiple theories attempting to explain why the markets are so intrigued by the Fed; some argue the Fed has become too transparent causing speculators to become pre-emptive. Others believe that technology, specifically online trading platforms developed over the last decade, that have brought mass speculation into the markets. Regardless of the cause, it is clear the markets are far more interested in pricing in fundamental changes in monetary policy immediately (even if they have not been confirmed yet), rather than waiting for the details to emerge. As we mentioned yesterday, in the "big picture" the difference between a quarter point rate hike in June vs. September is irrelevant. Based on the current celebration over the rate cut delay, it is reasonable to assume a temper tantrum when the inevitable day of reckoning finally arrives. We suspect, the timing of that realization will likely be in early-to-mid summer. In the meantime, the path of least resistance should be higher. Not much has changed from yesterday; seasonals and technicals in the Treasury complex are mixed, and intermarket relationships are present but weak. It is difficult to justify aggressive positions in either direction. However, the chart suggests that as long as prices stay below 164'15 in the June 30-year bond (ZB), the bears have a slight edge. Conversely, a break above this level gives the bulls the momentum. We prefer to see what the market does with this level before making any bold predictions. Let's see what Monday looks like. From a fundamental standpoint, it is difficult to be bullish Treasuries. However, seasonals are bullish and they are a factor that speculators shouldn't ignore. Similarly, we tend to be bullish equities and (believe it or not), higher stocks should support bonds. These two asset classes have been positively correlated roughly 44% of the time. Further, a stronger dollar has helped to drag Treasuries higher. Accordingly, being a bond bear isn't as easy as it might seem on the surface. On the other hand, chartists are pointing toward a potential key reversal. 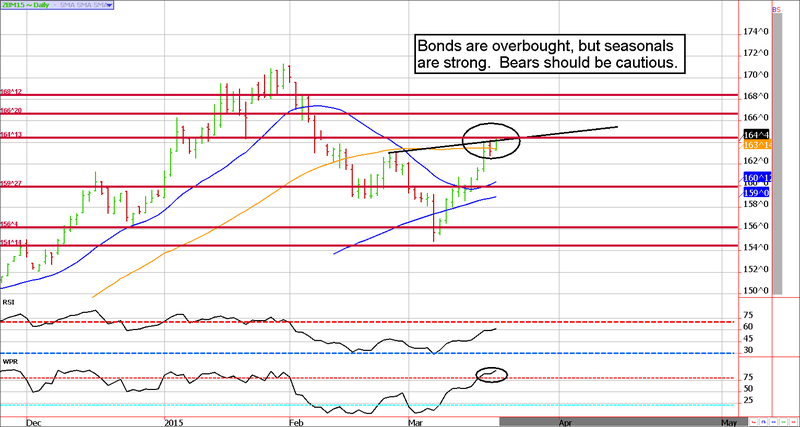 The way we see it, bonds and notes are worth a bearish position that can be categorized as a nibble. In other words, keep the risk small because there is just as much working in favor of Treasuries, as there is working against them. With that said, if you are looking for bullish trades, you've missed the "gravy train". Buying into an overbought market after its posted a key reversal, is a difficult trade. **Consensus:** We are getting mixed signals; it is too soon to know if this is a bear market bounce, or something the bulls can hold on to. SMALL bearish positions with SMALL risk are justified due to the chart set-up. More often than not, the S&P finds some sort of temporary price peak following a Friday morning futures contract expiration. The March expiration last year was particularly brutal for those bulls that got a little greedy. However, today's session went against the historical norm by adding to gains AFTER the March contract expired at 8:30 am Central this morning. This tells us the bull is healthier, and stronger, than most are giving it credit for. Some back and filling early next week seems likely; after all, we've had 8 consecutive sessions of switch-back performances so the odds are pointing toward a red Monday. Nevertheless, large dips will probably be bought into. 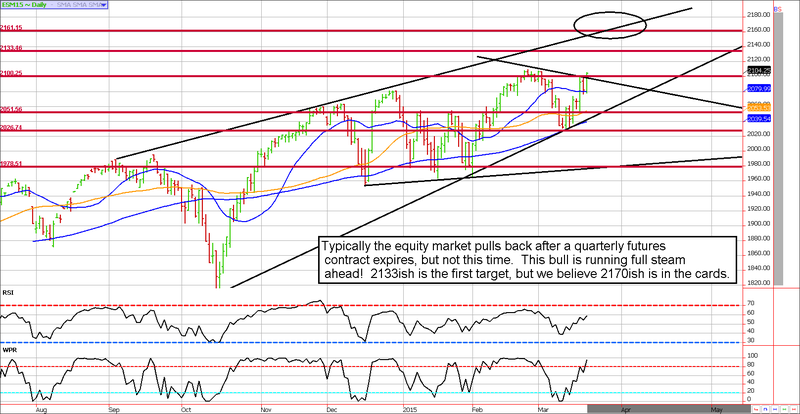 We'll be looking for this move to extend into the 2170 area in the coming weeks, but the initial target will be 2133. **Consensus:** We're overall bullish through April. Any large dips will likely prove to be buying opportunities. 2133ish will be the first upside target. Sell Levels: Let's see what Monday looks like. Buy Levels: Let's see what Monday looks like.